Exclusive Battle Damaged Cylon and Cylon Commander Action Figures inside! Packaged in a BSG-themed tin tote! Articulated, retro-style figures include rifle and sword accessories. Entertainment Earth Comic-Con Exclusive! This BSG-themed tin tote comes to you in glorious Cylon silver and black. Inspired by the Battlestar Galactica sci-fi TV series, the futuristic metal lunch box features an embossed chrome-metallic surface and the BSG logo. 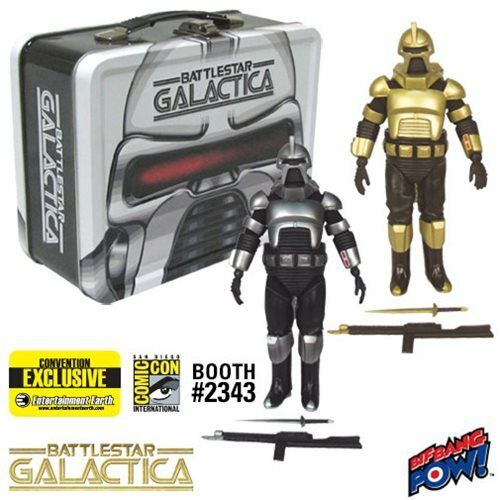 Even more exciting are the silver-colored Battle Damaged Cylon Centurion and gold Cylon Commander Action Figures included inside! Measuring 8-inches tall, these articulated action figures feature authentic fabric and armor pieces, plus incredible rifle and sword accessories and a retro style reminiscent of the bestselling "Mego" figures of the 1970s and 1980s. Order this... or else! The tote measures 8 5/8-inches wide x 6 3/4-inches tall x 4-inches deep. Limited edition of 1,500 pieces.